Today was the start of the second bootcamp session, we are doing 2 days a week now so I decided to bring in the scale and let the participants get their bodyfat measured before we start and then after we are done. Two days a week of bootcamp should make a difference to them no matter if it is strength gain, weight loss or bodyfat loss. I have decided on a 3 day rotation for the class of bodyweight work, weights work and finally a cardio/plyometric day. That way, if they can only come one day a week they won’t get stuck with the same type of workout each time. So we did the weigh in and got to work. Since it is part of the gymnastics class now, the gym girls were there too which is going to make the class pretty big some days. Before I list the workout though I want to just pat myself on the back a little if you don’t mind. Last night when I got on the scale I was 231lbs and 15% bodyfat. Now it’s been a while since I posted any of my goals and even though I consistently tell people that it’s not the weight that is important, it’s the bodyfat, I still wanted to get under 220lbs. However, it seems as though I have somehow, without even realizing it, dropped to my goal percentage while my weight has (at times frustratingly) gone nowhere. 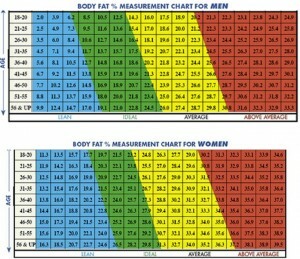 Bodyfat 15% – THAT’S 50% OF MY STARTING FAT PERCENTAGE!!! I still can’t believe that I have managed to pull off 15% body fat, the last time I was under 15% was when I was at university! As for the bootcamp peeps, the range was pretty healthy from 21-27% and to be honest I don’t expect to see much of a change since I think most of the participants could use some strength gains not percentage losses. This entry was posted on Tuesday, December 6th, 2011 at 10:33 AM	and is filed under Gymnastics / Bootcamp. You can follow any responses to this entry through the RSS 2.0 feed. You can leave a response, or trackback from your own site.